For other uses, see Projection (disambiguation). 3D projection is any method of mapping three-dimensional points to a two-dimensional plane. As most current methods for displaying graphical data are based on planar (pixel information from several bitplanes) two-dimensional media, the use of this type of projection is widespread, especially in computer graphics, engineering and drafting. Graphical projection is a protocol, used in technical drawing, by which an image of a three-dimensional object is projected onto a planar surface without the aid of numerical calculation. The projection is achieved by the use of imaginary "projectors". The projected, mental image becomes the technician's vision of the desired, finished picture. By following the protocol the technician may produce the envisioned picture on a planar surface such as drawing paper. The protocols provide a uniform imaging procedure among people trained in technical graphics (mechanical drawing, computer aided design, etc.). Parallel projection corresponds to a perspective projection with a hypothetical viewpoint; i.e. one where the camera lies an infinite distance away from the object and has an infinite focal length, or "zoom". In parallel projection, the lines of sight from the object to the projection plane are parallel to each other. Thus, lines that are parallel in three-dimensional space remain parallel in the two-dimensional projected image. Parallel projection also corresponds to a perspective projection with an infinite focal length (the distance from a camera's lens and focal point), or "zoom". 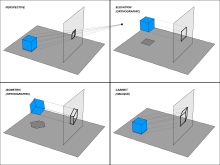 Images drawn in parallel projection rely upon the technique of axonometry ("to measure along axes"), as described in Pohlke's theorem. In general, the resulting image is oblique (the rays are not perpendicular to the image plane); but in special cases the result is orthographic (the rays are perpendicular to the image plane). Axonometry should not be confused with axonometric projection, as in English literature the latter usually refers only to a specific class of pictorials (see below). The orthographic projection is derived from the principles of descriptive geometry and is a two-dimensional representation of a three-dimensional object. It is a parallel projection (the lines of projection are parallel both in reality and in the projection plane). It is the projection type of choice for working drawings. While orthographically projected images represent the three dimensional nature of the object projected, they do not represent the object as it would be recorded photographically or perceived by a viewer observing it directly. In particular, parallel lengths at all points in an orthographically projected image are of the same scale regardless of whether they are far away or near to the virtual viewer. As a result, lengths are not foreshortened as they would be in a perspective projection. Symbols used to define whether a multiview projection is either Third Angle (right) or First Angle (left). With multiview projections, up to six pictures (called primary views) of an object are produced, with each projection plane parallel to one of the coordinate axes of the object. The views are positioned relative to each other according to either of two schemes: first-angle or third-angle projection. In each, the appearances of views may be thought of as being projected onto planes that form a 6-sided box around the object. Although six different sides can be drawn, usually three views of a drawing give enough information to make a 3D object. These views are known as front view, top view and end view. The terms elevation, plan and section are also used. 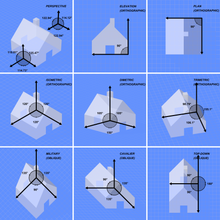 Axonometric projection is further subdivided into three categories: isometric projection, dimetric projection and trimetric projection, depending on the exact angle at which the view deviates from the orthogonal. A typical characteristic of orthographic pictorials is that one axis of space is usually displayed as vertical. Axonometric projections are also sometimes known as auxiliary views, as opposed to the primary views of multiview projections. In isometric pictorials (for protocols see isometric projection), the direction of viewing is such that the three axes of space appear equally foreshortened, and there is a common angle of 120° between them. As the distortion caused by foreshortening is uniform the proportionality of all sides and lengths are preserved, and the axes share a common scale. This enables measurements to be read or taken directly from the drawing. In dimetric pictorials (for protocols see dimetric projection), the direction of viewing is such that two of the three axes of space appear equally foreshortened, of which the attendant scale and angles of presentation are determined according to the angle of viewing; the scale of the third direction (vertical) is determined separately. Approximations are common in dimetric drawings. In trimetric pictorials (for protocols see trimetric projection), the direction of viewing is such that all of the three axes of space appear unequally foreshortened. The scale along each of the three axes and the angles among them are determined separately as dictated by the angle of viewing. Approximations in Trimetric drawings are common. In cavalier projection (sometimes cavalier perspective or high view point) a point of the object is represented by three coordinates, x, y and z. On the drawing, it is represented by only two coordinates, x″ and y″. On the flat drawing, two axes, x and z on the figure, are perpendicular and the length on these axes are drawn with a 1:1 scale; it is thus similar to the dimetric projections, although it is not an axonometric projection, as the third axis, here y, is drawn in diagonal, making an arbitrary angle with the x″ axis, usually 30 or 45°. The length of the third axis is not scaled. 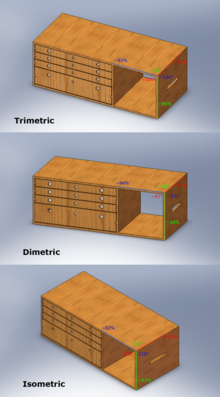 The term cabinet projection (sometimes cabinet perspective) stems from its use in illustrations by the furniture industry. Like cavalier perspective, one face of the projected object is parallel to the viewing plane, and the third axis is projected as going off in an angle (typically 30° or 45° or arctan(2) = 63.4°). Unlike cavalier projection, where the third axis keeps its length, with cabinet projection the length of the receding lines is cut in half. An example of the limitations of isometric projection. The height difference between the red and blue balls cannot be determined locally. 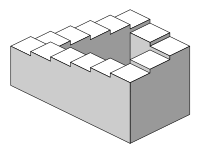 The Penrose stairs depicts a staircase which seems to ascend (anticlockwise) or descend (clockwise) yet forms a continuous loop. Objects drawn with parallel projection do not appear larger or smaller as they extend closer to or away from the viewer. While advantageous for architectural drawings, where measurements must be taken directly from the image, the result is a perceived distortion, since unlike perspective projection, this is not how our eyes or photography normally work. It also can easily result in situations where depth and altitude are difficult to gauge, as is shown in the illustration to the right. In this isometric drawing, the blue sphere is two units higher than the red one. However, this difference in elevation is not apparent if one covers the right half of the picture, as the boxes (which serve as clues suggesting height) are then obscured. This visual ambiguity has been exploited in op art, As well as "impossible object" drawings. M. C. Escher's Waterfall (1961), while not strictly using parallel projection, is a well-known example, in which a channel of water seems to travel unaided along a downward path, only to then paradoxically fall once again as it returns to its source. The water thus appears to disobey the law of conservation of energy. An extreme example is depicted in the film Inception, where by a forced perspective trick an immobile stairway changes its connectivity. 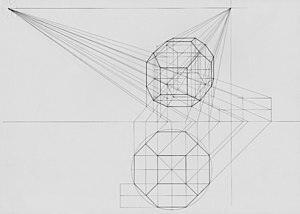 Perspective of a geometric solid using two vanishing points. In this case, the map of the solid (orthogonal projection) is drawn below the perspective, as if bending the ground plane. Axonometric projection of a scheme displaying the relevant elements of a vertical picture plane perspective. The standing point (P.S.) is located on the ground plane π, and the point of view (P.V.) is right above it. P.P. is its projection on the picture plane α. L.O. and L.T. are the horizon and the ground lines (linea d'orizzonte and linea di terra). The bold lines s and q lie on π, and intercept α at Ts and Tq respectively. The parallel lines through P.V. (in red) intercept L.O. in the vanishing points Fs and Fq: thus one can draw the projections s′ and q′, and hence also their intersection R′ on R.
Perspective projection is a linear projection where three dimensional objects are projected on a picture plane. This has the effect that distant objects appear smaller than nearer objects. It also means that lines which are parallel in nature (that is, meet at the point at infinity) appear to intersect in the projected image, for example if railways are pictured with perspective projection, they appear to converge towards a single point, called the vanishing point. Photographic lenses and the human eye work in the same way, therefore perspective projection looks most realistic. Perspective projection is usually categorized into one-point, two-point and three-point perspective, depending on the orientation of the projection plane towards the axes of the depicted object. Graphical projection methods rely on the duality between lines and points, whereby two straight lines determine a point while two points determine a straight line. The orthogonal projection of the eye point onto the picture plane is called the principal vanishing point (P.P. in the scheme on the left, from the Italian term punto principale, coined during the renaissance). its vanishing point, found at the intersection between the parallel line from the eye point and the picture plane. The principal vanishing point is the vanishing point of all horizontal lines perpendicular to the picture plane. The vanishing points of all horizontal lines lie on the horizon line. If, as is often the case, the picture plane is vertical, all vertical lines are drawn vertically, and have no finite vanishing point on the picture plane. Various graphical methods can be easily envisaged for projecting geometrical scenes. For example, lines traced from the eye point at 45° to the picture plane intersect the latter along a circle whose radius is the distance of the eye point from the plane, thus tracing that circle aids the construction of all the vanishing points of 45° lines; in particular, the intersection of that circle with the horizon line consists of two distance points. They are useful for drawing chessboard floors which, in turn, serve for locating the base of objects on the scene. In the perspective of a geometric solid on the right, after choosing the principal vanishing point —which determines the horizon line— the 45° vanishing point on the left side of the drawing completes the characterization of the (equally distant) point of view. 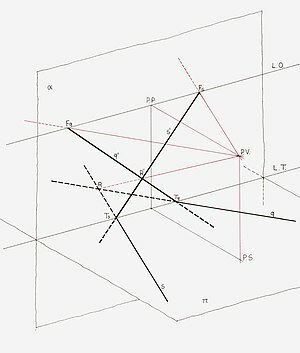 Two lines are drawn from the orthogonal projection of each vertex, one at 45° and one at 90° to the picture plane. After intersecting the ground line, those lines go toward the distance point (for 45°) or the principal point (for 90°). Their new intersection locates the projection of the map. Natural heights are measured above the ground line and then projected in the same way until they meet the vertical from the map. While orthographic projection ignores perspective to allow accurate measurements, perspective projection shows distant objects as smaller to provide additional realism. – the 3D position of a point A that is to be projected. – the 3D position of a point C representing the camera. – The orientation of the camera (represented by Tait–Bryan angles). - the display surface's position relative to the camera pinhole C. Most conventions use positive z values (the plane being in front of the pinhole), however negative z values are physically more correct, but the image will be inverted both horizontally and vertically. is the distance, from the 3D point being projected, to the entrance pupil. Subsequent clipping and scaling operations may be necessary to map the 2D plane onto any particular display media. , or simply as an orthographic projection plus a scaling. from the camera without significant errors in the projection (compared to the full perspective model). Because the camera is in 3D, the same works for the screen y-coordinate, substituting y for x in the above diagram and equation. Wikimedia Commons has media related to Graphical projection. ^ Mitchell, William; Malcolm McCullough (1994). Digital design media. John Wiley and Sons. p. 169. ISBN 978-0-471-28666-0. ^ Maynard, Patric (2005). Drawing distinctions: the varieties of graphic expression. Cornell University Press. p. 22. ISBN 978-0-8014-7280-0. ^ McReynolds, Tom; David Blythe (2005). Advanced graphics programming using openGL. Elsevier. p. 502. ISBN 978-1-55860-659-3. ^ "Axonometric projections - a technical overview". Retrieved 24 April 2015. ^ Ingrid Carlbom, Joseph Paciorek (1978). "Planar Geometric Projections and Viewing Transformations" (PDF). ACM Computing Surveys. 10 (4): 465–502. CiteSeerX 10.1.1.532.4774. doi:10.1145/356744.356750. .
^ Riley, K F (2006). Mathematical Methods for Physics and Engineering. Cambridge University Press. pp. 931, 942. doi:10.2277/0521679710. ISBN 978-0-521-67971-8. ^ Goldstein, Herbert (1980). Classical Mechanics (2nd ed.). Reading, Mass. : Addison-Wesley Pub. Co. pp. 146–148. ISBN 978-0-201-02918-5. ^ Sonka, M; Hlavac, V; Boyle, R (1995). Image Processing, Analysis & Machine Vision (2nd ed.). Chapman and Hall. p. 14. ISBN 978-0-412-45570-4. ^ Subhashis Banerjee (2002-02-18). "The Weak-Perspective Camera". ^ Alter, T. D. (July 1992). 3D Pose from 3 Corresponding Points under Weak-Perspective Projection (PDF) (Technical report). MIT AI Lab. Kenneth C. Finney (2004). 3D Game Programming All in One. Thomson Course. p. 93. ISBN 978-1-59200-136-1. Koehler; Dr. Ralph (December 2000). 2D/3D Graphics and Splines with Source Code. ISBN 978-0759611870. Wikimedia Commons has media related to 3D projection.